Fuel cells combine a fuel (usual hydrogen in some form) with an oxidizing agent (usually oxygen). In the hydrogen fuel cell, hydrogen and oxygen react to form water as a by-product. Electrical current is produced when electrons are freed during the process, which is clean, quiet, and more efficient than burning fuels. A fuel cell is a device that converts electrochemical energy into DC, much like a battery. One difference is that a battery stores its chemicals inside; a fuel cell has a constant flow of fuel into the system from an outside source. Early major users of fuel cells were NASA and the military because of their very specialized requirements and because the high cost of manufacture was not the main issue. Fuel cells were first used by NASA in 1962 in the Gemini space program, a manned space program. Fuel cells replaced battery power as a power source on the shorter flights of the Mercury space program, which preceded Gemini. Improved alkaline fuel cells were used for the longer flights to the moon on the Apollo missions, and later on the space shuttle. NASA went on to fund 200 research contracts for fuel cell technology. Today, renewable energy systems are able to take advantage of this research. Today fuel cells are used to produce electrical power for newer spacecraft; remote undersea stations; and mobile vehicles such as automobiles, trucks, buses, forklifts, and tractors. Some larger fuel cells provide power to buildings or small cities as a stationary electrical plant. These units are highly reliable and can bring power closer to the end user, and thus save on distribution costs. Like all physical systems, chemical reactions tend to go from a higher energy state to a lower state (energy decreases). This chemical equation shows that two molecules of hydrogen can react with one molecule of oxygen to produce two molecules of water plus a net change in energy (called free energy). The process involves breaking the chemical bonds in the gases (H2 and O2), which absorbs energy. New bonds are formed in the water molecule, which releases energy, and the system becomes stable at a lower energy. The free energy of the system has decreased and has appeared as heat and light from the reaction. Not all of the energy in the reaction is available for work—some go into an increase in entropy, a quantity that measures randomness of disorder in a system. This energy is not available for work, so there is an automatic limit on the efficiency of a fuel cell. Sir William Grove, a British scientist who is often referred to as the father of the fuel cell, performed research in 1839 on reversing the electrolysis of water. Groves found that it was possible to free electrons in the process, and the free electrons could power a small electrical load. In 1889, Charles Langer and Ludwig Mond completed further research in Britain and coined the term fuel cell. In 1932, Francis Bacon, at Cambridge University in England, developed what was perhaps the first successful fuel cell device, with a hydrogen-oxygen cell using alkaline electrolytes and nickel electrodes. The chemical reaction for the combustion of hydrogen is called an oxidation reaction (in this case, combining hydrogen with oxygen). The process involves transferring electrons from hydrogen to oxygen; hydrogen loses electrons and oxygen gains electrons. Oxidation is the process in which one reactant loses one or more electrons, and reduction is the process in which a reactant gains one or more electrons. The two processes always occur together, so the type of reaction is referred to as a redox (from reduction-oxidation) reaction. The reaction described for oxidation of hydrogen is one of the most common reactions used for fuel cells. In a fuel cell, the free energy is turned into electricity and heat. The reactions vary from one cell to another, but all fuel cells use a redox reaction in which electrons are separated from a fuel (oxidation), travel in an external circuit, and combine (reduction) with oxygen to complete the process. Like fuel cells, batteries also use redox reactions in which electrons travel through the external circuit to complete the reaction. The main difference is that, in a fuel cell, a constant supply of fuel is supplied, whereas, in a battery, the reactants are stored within the battery. You may have noticed that the arrow in the equation for the oxidation of hydrogen is double-headed, implying that the reaction is reversible. To separate the resulting water molecules back into hydrogen gas and oxygen gas, energy must be added. Electrolysis is the breaking down of a substance that contains ions by applying an electric current between two electrodes and separating the substance into its components. 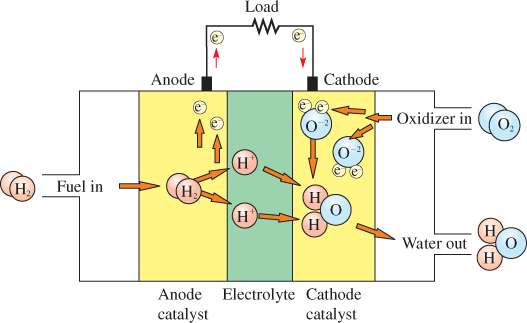 The electrolysis of liquid water breaks it down into hydrogen and oxygen gases, which is one way to obtain pure hydrogen fuel for use in a fuel cell. Although hydrogen is the most common element in the universe, it is not available in its elemental form on earth and must be generated from some other source. For this reason, it is not considered to be a primary source. It is important to understand that the energy to produce hydrogen is never fully recovered. If an electric power plant that burns a fossil fuel is used to create the hydrogen used in a fuel cell, the net effect is more steps in the process, and each step loses a little of the available energy. 3) An electrolyte, which is a conductive substance that passes hydrogen ions from the anode to the cathode. The type of material for the electrolyte differs in various types of fuel cells, but it must meet certain requirements, such as mechanical strength and resistance to impurities, as well as being a good conductor. Within the cell, hydrogen ions migrate across a barrier and combine at the cathode to complete the reaction. The anode and cathode provide the electrical connection to the external electrical circuit. The electrolyte material is sandwiched between the anode and cathode. Together, the components in a fuel cell, which includes the anode and cathode electrodes, the electrolyte, and the catalyst, form an assembly called the membrane electrode assembly, where the chemical reactions occur. The anode is made of porous material such as carbon and is coated by platinum. It must be capable of allowing hydrogen ions to pass while discriminating against electrons and hydrogen molecules. The catalyst in the cathode breaks apart oxygen molecules, forming two oxygen ions. The cathode is made of porous material that is coated by a material such as platinum or nickel and allows the hydrogen ions to combine with the oxygen ions to form water molecules (H2O), which are eliminated from the cell as a by-product. Both the anode and cathode are constructed with a catalyst. This means that both the anode and cathode must be able to facilitate the reactions within the fuel cell; ideally, they should have high electrical conductivity as well. The best materials for the electrodes depend on the type of fuel cell. Water is removed from the fuel cell at the bottom right side in Figure 1. Some fuel cells also create extreme heat during the process, so the heat can be used to heat buildings or to create steam, which can be used to power a steam turbine to make electrical power. By controlling the means by which such a reaction occurs and directing the reaction through a heat exchanger, it is possible to harvest the heat energy. Some fuel cells must operate on pure hydrogen and pure oxygen, while others have been designed to operate on hydrocarbon fuels such as methane, butane, natural gas, coal, or gasoline. These fuel cells use a reformer, which separates the hydrogen from the hydrocarbon fuel. Hydrocarbons are especially useful for fuel cells in vehicles because transporting pure hydrogen is expensive and dangerous. The fuel cell itself is but one part of the overall fuel cell system. Fuel cell systems are used for applications such as stationary power units and for transportation, that is, electric vehicles. A fuel cell system has three basic parts: the fuel cell stack; the fuel processing unit; and a heat recovery system that processes the excess heat that is a by-product of the fuel cell operation. Systems that have AC output for the grid have a standard electrical inverter to change the DC output to AC. Some systems also have a water containment subsystem. The fuel cell stack consists of a group of fuel cells that are connected and bound together to provide increased electrical power. 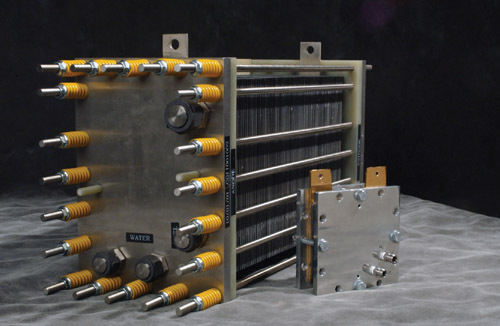 The output voltage of a single fuel cell is very small (about 0.7 V), so fuel cells are connected (stacked) in series to increase the voltage and in parallel to increase the amount of current they can provide. The stack is typically rated by the total wattage it can provide. The exact number of cells and how they are connected depends on the current, voltage, and power requirement of the load. The system includes an inverter if the load requires AC. Figure 2 shows a 5-kW fuel cell stack and a physically smaller 25 W fuel cell stack. The fuel processing unit is the portion of a fuel cell system that converts the input fuel into a form usable by the fuel cell. If hydrogen is fed to the system, a processor may not be required, or it may be needed only to filter impurities out of the hydrogen gas. In solar energy systems, the system may be used to prepare pure hydrogen and oxygen from water; in which case, the fuel processor is not needed. Larger fuel cell systems frequently use methane or another hydrocarbon to produce electrical power, so the fuel processor is required to extract the hydrogen from the hydrocarbon. Fuel cells typically operate at high temperatures (up to 600° C to 700° C), so they produce heat as a by-product. The heat recovery system collects excess heat for another use, which increases the overall energy efficiency of the fuel cell system. The excess heat can be used for hot water and/or steam generation. Steam can be used to drive a turbine and generator to produce electricity. Hot water can be used to provide heat for buildings or power an absorption air-conditioning system. How many 25-watt fuel cell stacks are needed to produce 5 kW? The total number of 25-watt fuel cell stacks needed to produce 5 kW: 5 kWy0.025 kW = 200 fuel cell stacks. Regenerative fuel cells produce electricity from hydrogen and oxygen, and they generate heat and water as by-products, just like other fuel cells. The regenerative fuel cell systems also receive extra hydrogen and oxygen from water that is processed from electrical power produced by a solar panel or wind turbine. Electricity from a solar cell or wind generator is used to recycle water from the fuel cell into hydrogen and oxygen through electrolysis. This process is unique because all the energy is produced through renewable energy systems. It has been used by NASA on space flights that get electrical power from solar panels as well as fuel cells. In this case, the hydrogen and oxygen can be stored for use in the fuel cell when solar energy is not available. Hydrogen is the basic fuel for most fuel cells. As mentioned previously, hydrogen is not available naturally and must be produced from another source, so it is not considered to be a primary source. Electrolysis of water has been mentioned as a useful method for obtaining hydrogen from any source of electricity, including renewable sources. Electrolysis can produce very pure hydrogen, but it is simply the reverse fuel cell reaction, so it requires a source of electric power and always requires more energy to produce the fuel that can be obtained from the fuel cell. If the source of electricity for producing the fuel is a renewable source, such as solar or wind, the hydrogen may serve as an energy storage mechanism, available whenever needed and without depleting nonrenewable sources. Another method used to produce hydrogen is a reaction called steam reformation in which methane (CH4) and steam are passed over a catalyst to produce carbon monoxide (CO) and hydrogen (H2). The thermal or catalytic process of breaking down a large molecule into smaller ones is called reforming (such as what happens when gasoline is separated from oil). A problem with steam reformation is that the resulting hydrogen is not as pure as with electrolysis, so is not suitable for all types of fuel cells. Also, using a fossil fuel such as methanol, natural gas, propane, gasoline, coal gas, or even coal powder to obtain hydrogen is not carbon-neutral except in the case of biofuels, so this may not be the most desirable way to obtain hydrogen. No matter how it is obtained, the hydrogen normally is stored as a cryogenic liquid. Hydrogen liquifies, boils, and condenses at −252.5° C (−422° F) at atmospheric pressure. If hydrogen is stored under pressure, its temperature can be higher before it changes from a liquid to a vapor. Generally, hydrogen is transported in vehicles as a liquid at cryogenic temperatures, which is one of the problems associated with its use. Converting gaseous hydrogen to a liquid requires a significant amount of energy. Hydrogen is highly flammable and an accident involving the exposure of liquid hydrogen to the environment means immediate evaporation into a gaseous state, which can be explosive. Thus, stringent safety measures need to be in place for transporting liquid hydrogen and detecting any leaks. Hydrogen gas must be under very high pressure, but gaseous transport by pipeline offers advantages over other forms of moving it. No matter how it is stored, hydrogen can enter the microstructure of many metals, so special tanks and pipelines need to be constructed. Newer hydrogen storage tanks are reinforced with composite carbon fibers that allow hydrogen to be stored at high pressure. To reduce costs, most hydrogen is prepared close to the place where it will be used. Hydrogen for fuel cells can be produced easily by using electricity to separate hydrogen from water or other materials. The biggest drawback to this process is that, in many cases, the electricity used for this process was produced by burning hydrocarbon fuels such as coal or natural gas. It is possible to use electricity produced by wind turbines or solar panels to make hydrogen. This process is considered a renewable form of energy because the electrical power to isolate the hydrogen comes from a renewable energy system, and it may help by providing a way to store the energy from solar or wind for use as needed. Nanotechnology is being used in several ways with fuel cells. One way is to reduce the amount of expensive platinum that is used as the catalyst in certain types of fuel cells. Nanotechnology allows platinum nanoparticles to be produced. The nanoparticles are used to provide a thinner coating on the anode, which reduces the amount of platinum in the fuel cell and reduces the cost of production. Nanotechnology is also used to create lighter, more efficient fuel cell membranes. Researchers at the University of Dayton in Ohio found that an array of carbon nanotubes could be used as a catalyst in some fuel cells. This new material makes the fuel cell more durable, and the material can be made less expensively than more traditional materials. Fuel cells are very reliable. Their advantages for producing electricity, particularly in remote locations, include no moving parts, quiet operation, and heat as a by-product. They also produce clean water as a by-product. A disadvantage of some fuel cells is that they use expensive platinum catalysts. Platinum is expensive because it is in high demand for many other applications. Fuel cells that use hydrogen gas as a fuel also have an issue with storing the hydrogen gas safely. As we noted, hydrogen gas must be stored under high pressure. List the three basic parts of a fuel cell. Explain what each part does? Explain how a fuel cell produces electrical current. Explain what a reformer does. What are the benefits of carbon nanotubes for certain fuel cells? The basic parts of a fuel cell are the anode, the cathode, and an electrolyte. The anode separates hydrogen into ions and electrons, the cathode forms oxygen ions that combine with hydrogen ions to form water, and the electrode is a conductor that passes hydrogen ions to the cathode. Oxidation is a loss of electrons; reduction is a gain in electrons. A fuel cell, like a battery, completes an oxidation-reduction reaction, which is a transfer of electrons between reactants. The electrons are transferred in the external circuit, forming a current. A reformer converts a hydrocarbon fuel to hydrogen fuel. Carbon nanotubes can reduce the amount of platinum required for the fuel cell and can serve as a catalyst in some fuel cells.